1897 publication, "The Churches of Brighton"
of instalments over a period of time. "This lofty and striking building, although of colossal size, is not yet finished, the nave being, so far, the only portion erected. The dimensions of this instalment of the church are, however, so gigantic that St Bartholomew's is one of the most conspicuous structures in Brighton." A writer in the World, in an article dated 1 December 1880, described the church thus, and sketches in easy fashion the intended additions to it. He said: "St Bartholomew's, of which only the nave capable of seating about 1,600 has as yet been completed at a cost of £18,000, is a fine example of the brick architecture of Germany, on which it was modelled, and, on completion of the apse and transepts, will be an edifice of cathedral proportions and dignity." It so happens that the east wall of the nave abuts immediately upon a public thoroughfare, and there would thus appear to be little probability of transepts being erected, as the eastern one, if such were the case, would of necessity project into the roadway, a contingency the writer, perhaps, had not calculated upon, or the founder either, it may be, - as to the latter it is diffcult to tell. The facility for extension of the church on the west side which this purchase gives is obvious, and was possibly an ulterior object when the investment was made. In the Sanitary Exhibition, recently held at the Royal Pavilion Brighton, a view of St Bartholomew's Church, with the apse and chancel added, was amongst the exhibits. Although anything in the way of an extension sounds rather preposterous, it was from the first intended to lengthen the church. The Builder for October 31st 1874, in a description accompanied by a fine engraving said: "The plan of the work done is a simple parallelogram (sic) of nine bays of 19 feet each. If finished, it would have about two extra bays more but when this will be done is at present uncertain." In another part of the article, the writer remarks: "The north end wall has been so built that when it may be deemed advisable, the building may be lengthened as already mentioned." St. Bartholomew's was built at the sole cost of the Rev. Arthur Wagner, M.A., Vicar of St. Paul's, West-street, Brighton, and one effect of the enterprise was to provoke, probably, as large an amount of abuse and opposition as were ever encountered by any individual in the prosecution of such a work. Not that the rev. gentleman monopolized by any means the reproaches that were dealt out with unstinted liber­ality; they fell upon all connected with the church— the founder, the architect, the Bishop of the Diocese who opened it, the clergy present at the opening, the building in every detail, the Town Council who per­mitted its erection, the bell calling the worshippers to service, the worshippers who responded to the call, the services themselves, in a word upon everything; in spite of which—or perhaps even partly in consequence of which—the work has been carried on with unflagging zeal, and the position of St. Bartholomew's as a power­ful and successful advanced Ritualistic Church, has long been acknowledged, the opposition having gradually died a natural death. The following particulars will help those who have not seen St. Bartholomew's to realize a little what this building, unique amongst the Churches of Brighton, and, if we mistake not, of England, is like. As already mentioned, it is "a simple parallelogram" (sic) so far, but the dimensions, are a little difficult to grasp. The nave is 180 feet long, outside measurement—170 internal—the total width is 58 feet from wall to wall, the height from the ground to the parapet is 90 feet, but to the ridge of the roof it is 135 feet, whilst a gilt cross at the south apex of the gable rises to an additional height of 15 feet. Anyone who does this and stands in the open narrow gallery under the great circular window—panting with the exertion of ascending a flight of almost innumerable stone steps, and sees the abysmal depth below, and the roof still at a distance above him sufficiently great to look lofty: about the same as the roof of an ordinary church would appear from the floor of the nave—will come away with a profound conviction that St. Bartholomew's Church is one of the wonders of Brighton. The writer was informed that the dimen­sions of the building are about the same as those of the nave of Westminster Abbey. The material mainly used in the construction of the edifice is brick, of the kind technically known as "picked stocks," relieved by courses of stone. 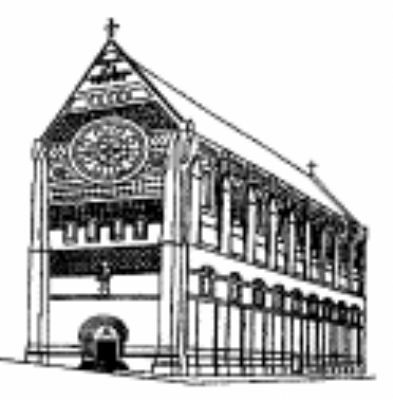 Although the church has been condemned as ugly—and so vast a quantity of brick­work has a heavy appearance—a considerable amount of relief has been imparted by the insertion of bricks of different tints, arranged in geometrical patterns on both the outer and inner walls; the same plan has been adopted with the roof, which consists of " black, reddish, and green slates, disposed diagonally and finished with a cresting of red earthenware "; whilst the floor is covered with red tiles also disposed diagonally, the intersection being marked with ornamental glazed tiles; the effect of the floor as seen from the triforium is exceedingly good. The most oppressively heavy portion of the build­ing, in its present state, is the front, but it is not by any means featureless. The main entrance is here; it is of good proportion for an ordinary building, but dwarfed into insignificance by the superincumbent mass of brick between it and the great window. The doorway is deeply recessed, and has on each side an arcade of four circular stone columns, with unsculptured capitals and bases. The arch is of brickwork, as is the column dividing the two oaken doors. Between the doors and the archway, slates are temporarily placed, but sculptured stone will ultimately be inserted. Over the arch is a canopied niche of Portland stone, intended for a statue of the patron saint; over the canopy is a broad band of diaper work formed of red kiln bricks; over this again is a row of four lancet windows of comparatively small size; above this is the circular window 30 feet in diameter, and said to be the largest in England. It is filled with cathedral tinted glass, disposed in geometric designs but including outlines of eight bells; on each side of this window are two stone circles filled with red encaustic tiles, with a cross of black tiles, and a blue tile in each angle formed by the intersecting lines. Over the window, and partly enclosing it, there is more diaper work; whilst higher yet, there is an opening through which, with some craning of the neck and straining of the eyes, the church bell can be seen ; over this large aperture are smaller ones for ventilation, above this the ridge of the roof, and to crown all the gilt cross. To the east and west of the front a bold buttress rises from the ground to the wall plate. The sides of the building are much more attractive externally than the front. On the east side is a door similar in design to the main entrance, but smaller; high above-this is a range of nine small, single-light, pointed windows, one to each bay, filled with cathedral tinted glass. Above these are nine clerestory windows, similar in design, but of larger size, divided by brick-work piers; whilst above them, and im­mediately under the eaves, is an arcade of brickwork arches, and a bold cornice of the same material. The same architectural features mark the west side, except that there are two doors instead of one. The approach to the door nearest the street on the west side is by a covered passage which projects beyond the main building; the porch is surmounted by a cross of stone, enclosed in a circle of the same material. On ordinary occasions the congregation enters by this covered way. The north end of the building has a very plain exterior; there are two small windows with pointed heads, and three external balconies for giving access to the outside when repairs are necessary. The northern gable of the roof is surmounted by a light iron cross. On entering the church by the covered passage on the west, just mentioned, (no longer the main entrance. ed) the eye is attracted in several directions at once—no unusual experience perhaps on entering a public building, but St. Bartholo­mew's Church is to a stranger simply bewildering. and when his eye, it may so chance, finally rests upon a framed illuminated list, hung upon the wall, close to the door he entered by, containing a request for prayer on behalf not only of certain sick persons, but of certain deceased persons also, he will be apt to rub his eyes and wonder more than ever. Having in a general way indicated some of the salient features of St. Bartholomew's Church, a slight sketch of its history and some details as to the interior, the appointments, services, the officiating clergy, and of the institutions connected with the church may be of interest. This unloquacious legend may be understood as implying that the church dates only from 1874, but this is not the truth, at least it is not the whole truth. A writer in the Brighton Gazette said of it in 1875:—" Of exactly the same true type as its fellow temporary churches—St. Mary Magdalene's and the Church of the Annunciation, it is smaller than either of them. As we remember seeing the church on a festive occasion, which attracted us within its friendly walls, it showed itself as a plain, but neat and richly-decorated little chapel. There were pictures of the Stations of the Cross on the walls, rich and handsome banners, a most beautiful altar and sanctuary, and, what to our mind was the most pleasing and significant sight of all, a dense crowd of worshippers joining, &c." Thankfully availing our­selves of the opportunity of evading the responsibility of deciding whether the original St. Bartholomew's Church and the other churches enumerated are, or are not, of the "true type"; also of explaining how a building of any type can, except in type, be both " plain " and "richly decorated," we gather from the description just quoted and from other sources that the Mission Chapel was, although not at first, a success— in fact it became crowded. Steps were taken therefore to erect the larger building. The architect selected was Mr. Edmund E. Scott, of Brighton, and the con­tractors engaged were Messrs. Stenning. We are unable to give the exact date of the commencement of the work, but, in October, 1873, the Rev. Mr. Wagner and the Brighton Town Council were at loggerheads over the affair. It was as Mr. Pepys would have said, " pretty to see " the course of the negotiations between the contending parties, and to note the terms used in the Town Council in describing the church. It was called, in the course of the discussion, and in the news­paper correspondence excited by it, "a cheese ware­house," a "Noah's Ark in brick," a "monster ex­crescence," "the Wagner folly," "a brick parallel­ogram," "a huge barn;" it was described as "uselessly large, painfully ugly, and sadly out of place." Mr. Wagner was accused of having sent in a plan of a church that was to be 82 feet high, and then when some deviation in the plans was sanctioned, exceeding the limit of variation and running up a building 135-feet high in spite of the Town Council, the Surveyor, and the '' bye laws". It was proposed to prosecute Mr Wagner for a breach of the said "bye laws " with the prospect of getting the rev. gentleman fined " forty shillings and costs"; fortunately for the honour of the Town Council a more worthy course was pursued and an amicable settlement was arrived at, there being only 11 votes recorded in favour of the resolution that legal proceedings should be taken, and 20 against it. After considerable delay arising from the magnitude of the work, and from unavoidable causes, St. Bartholomew's Church was opened in 1874 as a licensed but not as a consecrated building. The opening ceremony took place on Tuesday, 8th September, 1874, on the Feast of the Nativity of the Virgin Mary. The occasion was a memorable one in the local ecclesiastical annals, and the church, vast as it is, was filled at the principal service to overflowing. To the delight of the Ritualists, and to the disgust and discomfiture of the opponents, principally anonymous correspondents, signing themselves " No Popery," "Haters of Shams," etc., in the various local journals, his Lordship the Bishop of the Diocese (Dr. Durnford) preached at the eleven o'clock service, and took up the cudgels for the Rev. Mr. Wagner and the church he had built. How his Lordship reconciled his approval of what he saw, with some of his previous and subsequent utterances, is no part of our business to decide, but he thus expressed his opinion of the church he was in the act of opening:—" Because it does not in all things resemble the churches we are accustomed to, is it, there­fore, to be an object of suspicion ? Is it the part of Christians so to spy out another's liberty, and to spy it out that it may be narrowed? Is it agreeable to the spirit of the Gospel to mature dislikes, to throw out imputations, to insinuate that this church is to be devoted to purposes of superstition? I look around me and I see nothing that our Church forbids, or that can justly be charged with superstition." After show­ing that English Christians were not in the habit of "worshipping images or pictures, or of worshipping "the one true God by the help or through the means of such likenesses," his Lordship said, "If it could be that the cross portrayed on that wall was so abused, or likely to be so abused, I should be the first to cry—'Let it be destroyed, for it is an abomination.' . . . But if our crucified Lord may be represented in painted glass, or on an altar piece, far more conspicuously than in this church, without fear of evil consequences, without offence, why should this likeness of the man Christ Jesus cause alarm ?" The services of the day did not com­mence with that at which His Lordship the Bishop of Chichester thus expressed himself, but with a celebra­tion of the Holy Communion at five o'clock in the morning, at which time a large number of persons were present; the Rev. J. J. Greene being the celebrant. At half-past six there was a choral celebration, at which about a thousand persons were present, the pro­cession was headed by a cross, encircled with a wreath of flowers. At eight o'clock, there was a third celebration, at which Dr. Durnford officiated. Morning Service was at eleven, but as early as nine the congregation began to assemble. It was calculated that 2,000 crowded into the building, whilst hundreds went away for want of standing room. Besides the Bishop, there were present his chaplain, the Rev. P. Mount (who preceded his Lordship with the crozier), the Revs. J. C. Campion (Proctor of the Diocese), Dr. Hannah (Vicar of Brighton), A. D. Wagner, C. Beanlands (St. Michael's), A. A. Morgan (Vicar of St. John the Evangelist's), J. M. Fincher, R. L Salmon (Vicar of St. Martin's), Ansell Jones (St. Martin's), J. H. Ashley Gibson, R. Payne, E. P. Cole, J. E. Haffiwell, Alfred Payne, J. J. Greene, P. Fletcher, C. H. Maunsell, A. Gurney, James Vaughan (Incumbent of Christ Church), J. H. North (Incumbent of St. George's), T. W. S. Collis (St. Paul's, Knightabridge), L. Hilton (Christ Church, Oxford), Dr. Collard, Canon Butler (Vicar of Wantage), Orby Shipley, Max­well Ben-Oliel, O. T. S. Davies, C. Walker, — Image, junr., — Illingworth, — Willis, etc. The-service was sung or intoned by the Rev. A. Payne, the first lesson was read by the Rev. A. D. Wagner, the second by Dr. Hannah. The sermon by the Bishop was founded upon the text, " He loveth our nation, and he hath built us a synagogue." The musical portion of the service was under the direction of the Rev. 0. Thompson, of the Church of the Annunciation, and was rendered by a special choir of 120 voices, selected from the choirs attending the different High Churches in the town. In the evening, the church was again densely crowded, when the preacher was the Rev. Canon Ashwell, Principal of the Chichester Theolo­gical College. During what is known as the octave, there were special services, all largely attended. The Rev. A. Payne was from the first the priest in charge of the mission—St. Bartholomew's being only regarded as a district church in connection with St. Paul's. The cost of the building and its capacity have been very variously estimated. Dr. Hannah, in his "Charge" for 1879, gave the expenditure in Lord Hampton's Return as £17,000, and the accommodation as 1,500 seats, all of which are free. As a matter of fact, the church at present is furnished with rush-bottomed chairs, such as are generally seen in the Continental cathedrals, and of these some 1200 only have as yet been provided; but there is space no doubt for the number given by Dr. Hannah, if not for more. The clergy associated with the Rev A. Payne, in the temporary chapel and at first in the larger building, were the Revs J. J. Greene, C. H. Maunsell, P. Fletcher, and A. Gurney, all of whom as well as Mr. Payne have now left for different appointments. The prosperity of St. Bartholomew's is considered by the congregation to date from the commencement of the Rev. Mr. Payne's ministry there in the small chapel in 1871. In July 1881, a parish was assigned to St. Bartholo­mew's Church, of which the Rev. T. W. S. Collis is now Vicar, the assistant clergy being the Revs. C.Parnell, L. B. Bartleet, and C. Henning. It would be very difficult to over-estimate the amount of downright hard work which these gentlemen have to do in connec­tion with the church and the institutions belonging to it. It is, of course, perfectly open to any person to dissent from their doctrines, to object to their mode of conducting service, and to set them—and all like-minded persons—down as being superstitious or mistaken. It is easy to see how in many respects the services are close copies of Roman Catholic models, and how they must tend to popularise Roman Catholic doctrines; but all this need not lead anyone to close his eyes to the fact that a wonderful amount of self-denial, earnestness, and devotion is displayed on the part of these clergymen in the prosecution of a work in which it is evident they throw their whole heart and soul; nor can it be denied that, as the result of years of incessant work, the clergy of St. Bartholo­mew's have secured the affection and sympathy of an immense number of the people of the parish and especially of the poor and artisan class in a manner which is really surprising. One slight proof of this may be mentioned; on great festivals it is customary to have a celebration of the Holy Communion at five in the morning, and we were assured, on the best authority, that on the early morning of Christmas Day 1880, there were in all 324 communicants at 5.30, 107, at 7 o'clock 114, and at 8 o'clock 103. The majority of these were working people. It could be no ordinary influence that would induce such a number to come on a winter morning to participate in a religious ceremony, in a building which, paved with tiles throughout, is cold and cheerless at the best of times in winter, the heating arrangements being totally inadequate, and the draughts being sufficient— to use a proverbial expression—" to turn a mil" This defect has, however, now been remedied to a great extent, by the whole of the roof having been covered with felt, at an enormous expense, as may readily be imagined when the dimensions of the church are taken into account, and the height of the building. Apropos of the subject of repairing lofty edifices it may be mentioned that to insert a pane of glass, which under ordinary circumstances would be about 3s, cost recently £1 15s. 0d. in one of the upper windows at St. Bartholomew's Church. At the time the church was erected, there were a number of comments provoked by the unusual position of the buttresses, which are placed against the inside of the walls of the nave instead of outside. The proceeding was peculiar and the exterior has a bare and denuded effect in consequence, but the interior has benefited. These buttresses or piers are of brick, they each project six feet, and are ten feet apart, and being joined above with pointed arches the building is thus furnished on each side with an arcade, the appearance of which is very good, as the absence of aisles is compensated for to some extent. From the crown of each arch is suspended a gilt iron rod, to which is fixed a gas corona also of gilt iron. By means of these the church is efficiently lighted at night. The double triforium, as already noticed, is above this arcade, the lower one being pierced by 27 lancet-headed openings on each side of the nave. The open­ings in the upper triforium are larger and less numer­ous than those in the lower one. So far as the writer of this sketch could tell he was not only treated courteously when visiting St. Bartholo­mew's Church, but was shewn all that there was to see: his ascent into the triforium has been duly chronicled and other incidents will be mentioned in the course of this discursive narrative; but he is free to confess that he was not shewn the following, nor can he conjecture where it is all secreted. A writer in the Brighton Heroin, for February 12th, 1874—it need hardly be added, an anonymous one—says:—"In a part of the building, apparently purposely shut out from observa­tion, there is a dark spiral staircase consisting of 176 steps, on various landings of which little and almost dark rooms, or cells, as they might be called, are built. At the first landing, 76 steps from the bottom, there are 18 of these cells, nine looking north-east and the other nine looking towards the Terminus, each cell being about 11 feet by 4½ feet, divided by a passage of 8 feet by 1½ feet; one dark cell being at each end 6 feet by 1½ feet. At 81 steps from the base there is a second set of cells similar to the others and of the same dimensions. At 97 steps there is another set of cells; at 105 steps there are four special cells, facing the large cross, which is built into the wall of this so-called Church, and there is a door here leading outside the top, in line with the bottom of the roof, with a curious nondescript place under the roof. The question naturally arises, to what use are these little cells to be appropriated?" Two other questions arise in the writer's mind, viz:—Firstly, where can this imposing network of cells be situated ? And secondly, why were the cells not shewn to him ? They certainly must constitute one of the curiosities of the Church, and an account of them should not be omitted from any description of St, Bartholomew's. One thing is reassuring, the writer to the journal quoted from may possibly have seen a double triforium for the first time in his life, and, by some means or other, such for example as an undue tendency to discover or imagine the marvellous, may have uncon­sciously got his account a little mixed. On the other hand, the measurements are strangely precise, and there may be a mystery in brickwork enshrined at St. Bartholomew's Church—the revelation of which, by "A True Protestant and no Sham," ought to have made the public shudder instead of its provoking their laughter. On the east side of the church is the Baptistry, which is simply formed by utilizing one of the arched recesses (the second from the south-east angle of the building) by placing in it a circular stone font of large size—the clustered plinth of which stands upon stone steps. The font baa the Sacred Monogram I. H. S. in front, and it has a flat wooden cover. The whole was a gift from the architect of the Church. There are three oil paintings suspended near the font—a figure of St. Anthony to the north, the Nativity immediately over it, and the Holy Family to the south. Not far from the font is a small door which may lead to the cells, but which we were informed communicates with the gas meter! The lofty cross built into the north wall is said to be 30 feet in height, to be formed of chalk and to have been painted from a drawing by Mr. S. Bell, an artist who was employed in the embellishment of St. Paul's Church, West-street The appearance of the cross would lead one to suppose it to be composed of white encaustic tiles. The pulpit is on the west side of the building at some distance south of the altar. It is a plain square-looking structure, with an equally plain, flat, sounding board suspended over it, the whole being a temporary substitute for a stone pulpit which is in­tended some day to supersede it. The sanctuary is large, but rather bare and cold looking; it is approached by a flight of six steps, with "risers " of encaustic tiles and "treads" of stone. The altar is approached by a flight of steps of similar material, each successive step decreasing in length. The front of the altar is divided into seven panels on which are painted, on gilt grounds —by Mr. S. Bell—the following subjects:—In the centre, the Crucifixion; to the right, St. Peter, St. Joseph and St Mary; to the left, St. John, St. Bartholomew, and St. Paul. On the re-table, or super altar, there is a large brass cross in the centre, there are six brass candelabra, two seven-branched candlesticks, sundry brass vases for flowers, and other ecclesiastical accessories, all of which are of large size, and were specially modelled for St Bartholomew's. On each side of the altar, at the foot of the pyramid of steps, are massive brass candelabra, each with a tall wax light, on which, just below the wick, is fixed a coloured shield with a gilt monogram upon it. It becomes one to speak with becoming caution of the canopy which rises above the altar, since the correct term for it excited quite a little storm of controversy at the time of its erection. As nearly as we can gather, it is " a canopied dosel," but we write under correction. On the front of the canopy is inscribed " Sanctus, Sanctus, Sanctus." A dwarf marble wall behind the altar forms a screen, which hides the vestries and sacristy from view; behind this screen the choir assembles ready to enter the Church in processional form; half of the choristers coming in by one doorway and half by the other. By the courtesy of the Vicar, the writer had an opportunity of inspecting all the vestments and banners in the sacristy, and whatever opinion he may happen to entertain as to the utility of such accessories to Divine worship, he has no hesitation in expressing admiration for what was exhibited, viewing them simply as works of art. There are vestments appro­priate to every season, and a rich collection of banners belonging to the different guilds connected with St. Bartholomew's Church. All the materials are of the choicest, and every part of the work is executed with exquisite care. The size of the Church affects the pro­portions even of these accessories, the banners having to be made of very large size, and the handsome gilt mountings of the principal ones being specially made to correspond. The chef d'oeuvre amongst the banners is one that was presented to the Vicar by the Rev. C. Walker on his institution to the vicarage. It is the banner of the Confraternity of the Blessed Sacrament, and is of silk, rich with embroidery in gold, silver, and colours. The representation of the Lamb in the centre of it is a beautiful specimen of raised work in bullion silver filigree. Some of the vestments are almost equally rich, and are very costly. A set of these, including a chasuble, a dalmatic, a tunicle and maniples for the use of the celebrant, deacon, and sub-deacon, upon high festivals, is estimated to have cost £80: and there are other seta almost equally valuable and artistic. The groundwork of each vest­ment is rich brocaded silk, and the costliness of the robes is enhanced by the linings—if they may be so described—being as carefully embroidered as the outside in every part which is liable to be seen. The reverse of each banner is also embroidered, no expense being spared. All the vestments have upon the back a Gothic cross of the shape commonly known as a Y cross. On great festivals, when the clergy are vested in these gorgeous robes, and the banners are displayed, the processions round the church are exceedingly striking; perhaps, however, the most imposing sight is when the procession is marshalled in front of the richly-decorated altar in readiness for making the cir­cuit of the building. The funeral vestments of black and gold are in their way as rich, although sombre, as the festival ones; it should, perhaps, be explained, that the bodies of deceased communicants are allowed to be brought into the Church for service before being taken to the Cemetery, if due notice is given. It need scarcely be said that music forms a special feature in the services at St. Bartholomew's. The organ, built by Messrs. Holditch, at a cost of £800, is located in the north-west angle of the building; it is a powerful instrument, in an oaken case, with plain metal pipes. The organist and choir-master, Mr. H. St. J. Bigg Wither, deserves great credit for the way in which—to use an expression which has been employed before—he renders the various services. It so happens that this gentleman not infrequently receives some praise to which he is not entitled, and this comes to pass, as the lawyers would put it:—"in manner following that is to say." The choir is not only a very large one, but, as a space of about 30 feet divides the choir stalls, it is a difficult matter to get both detach­ments to keep time. To obviate this, a cornet and a euphonium are pressed into the service, the former to lead the boys, and the latter the men. As these instru­ments are kept out of sight —the players are possibly in the cells, or more probably in the arched recesses already referred to—the effect is remarkably good, but the organist is often complimented upon his management of the trumpet stop, and is obliged, for the sake of candour, to dispel the illusion. At the south end of the building—technically the west end, the orientation of the church not having been attended to—foundations have been put in and other provisions made for the erection of a wide gallery for the accommodation of the organ and the choir. The various features connected with the church and its appointments may now be considered as disposed of; but a question remains to be considered, viz:—the extent to which what are known as Ritualistic practices are carried out in a church which has acquired a repu­tation for these amongst the English Catholic Churches in the town, and incurred not a little odium for the number of its converts to the Roman communion. Anyone visiting St. Bartholomew's Church would at once be struck with the ornate character of the service, and with its resemblance in many points to a Roman Catholic service. It is only fair to the clergy to say that they take their stand upon the Prayer Book and profess their conviction that it sanctions and even enjoins every practice that they carry put. The "Ornaments' Rubric" is especially relied upon; and the St. Bartholomew's clergy do not in some points go so far as they believe its sanction extends; where any point is doubtful as to the usage of the Church in the time of Edward the Sixth, they do not adopt it; but, where the testimony is explicit, they dare not, they say, disregard it. They argue that all clergymen of the Church of England who do not carry out the service according to the " Ornaments' Rubric," are acting illegally. It is needless to say that this is a matter upon which there has been almost endless controversy, and upon which there are a number of various opinions. As to the secession of a clergyman and a part of the congregation of St. Bartholomew's to the Roman Catholic Church, the following explanation is given. That there was, some four or five years ago, a large defection is not denied, but it is said to have been exaggerated, or, at all events, made the most of, by those who were rejoiced at its taking place. It is believed to have been largely due to the personal influence of certain curates at that time belonging to St. Bartholomew's Church, and to have, at least in many cases, been the result rather of sympathy than of conviction. On visiting St. Bartholomew's Church lately, at 11 o'clock, the high celebration was found to be just commencing. There was a large congregation present, including a number of Sunday Scholars, who were placed in front, and were very quiet and orderly. The behaviour of the congregation was devout in the extreme. The choir and clergy entered in processional form, headed by a brass cross, but without lighted tapers. The vestments of the three clergymen were rich and effective, but there were no birettas worn. There was no incense used throughout the service. There were two acolytes in scarlet cassocks, with white muslin albs and crimson girdles. The kneeling, bowing to the altar, crossing, raising the hands, and the actions generally were on the whole such as would be noticed in a Roman Catholic service. Wax candles were burning on the altar and seven lamps before it during the celebration, and the two large candles in the brass candelabra were also burning. There were flowers on the altar. The bell was not rung at the elevation of the cup; it is at other celebrations in the Church, but not at this. The reason for the omission is one that deserves to be known. A deputation, we were informed, having waited upon the Vicar of St. Bartholomew's, respectfully pointing out that the ringing of the bell interfered with the service at London-road Congregational Church, which is almost immediately opposite, the Rev. Mr. Collis kindly desisted from the practice and had the pleasure of receiving a copy of a resolution signed by the Rev. Robert Hamilton, and the members of the Committee of Management thanking him for the concession. During the recital of the Creed, both clergy and congregation kneel at the words " and was made man”. The sermon takes place in the course of the service. On the occasion of our visit the preacher was the Rev. C. Henning, and the sermon a very good one. It was prefaced and followed by "in the name of the Father, etc"; the prayers of the congregation were asked before the sermon for "the Rev. S. F. Green, prisoner for conscience' sake." We are informed that, whilst on the one hand there is dissatisfaction felt and expressed at the extreme character of the services at St. Bartholomew's Church—by those, that is to say, who are distressed at the Catholic revival in England generally, and even by some who sympathize to a certain extent with that great religious movement—there are others anxious to see further advances still. An offer has been made of a beautiful set of the " Stations of the Cross " from a celebrated firm at Bruges; but it has been declined by the Vicar. Two separate offers of magnificent copes have also been made and declined, whilst just recently a gentleman offered, if incense were introduced, to supply the requisite vessels. This too, has been declined. Whether the line is to be drawn at the point already reached, or the Church and its services are both to be developed in the future, must be left to that future to decide. It is quite evident that the matter rests almost entirely with the clergy, who, for good or ill, have gained great influence over the people. The devotion of the congregation to the church and to the clergy is little short of marvellous—the Vicar speaks in enthusiastic terms of the heartiness and cordiality that characterize the relations between himself and his parishioners, describing it as exceeding what he has ex­perienced during a ministry extending over many years, and exercised in the metropolis and in other places. The Ritualists are sometimes spoken of as attracting to their churches none but weak and silly women and children, but this does not apply to St. Bartholomew's. It attracts all classes. The service to men, on Sunday afternoons in the mission chapel, and the number of men in regular attendance as choristers in the larger building, are points upon which the Rev. Mr. Collis expatiates with peculiar satisfaction. Whilst so much has been said upon the church, it ought to have been remarked that the architecture is what is known as the Italian-Gothic, of which style there are numerous examples of churches on the Continent, and that some of the said churches are nearly as large as St. Bartholomew's. There is an endowment upon the Church of £150, provided out of a sum of money partly contributed by the Rev. Arthur Wagner, and partly by the Ecclesi­astical Commissioners; we are not aware of the exact proportions of the amount contributed, but understand that Mr. Wagner's was the larger sum of the two. The institutions belonging to St. Bartholomew's Church now call for a few remarks. Foremost amongst these stand the Day Schools; these are under Government inspection, they are located in a lofty building at the rear of the Church, at the side of the Mission Chapel, and are approached from Providence-place. There are departments for Boys, Girls, and Infants— all the School Rooms are in one lofty building—the Infants occupying the lower story, the Boys the second, and the Girls the upper story. The total number in average attendance is given at 400. The schools entail a very large expenditure; we are unable to present any particulars as to the educational status, not having seen the Inspector's report. There are Sunday Schools for Boys, Girls, and Infants, the hours of attendance being half-past ten in the morning and three o'clock in the afternoon. Although the schools have been placed thus prominently, in the " St. Bartholomew's monthly paper of Church Infor­mation," they are preceded by a list of the various Guilds, etc, belonging to the church. These are as follows:—The Guilds of St. Joseph, St. John, and St. Nicholas, for Men and Boys; the Guild of the Good Shepherd, for Women ; the Guild of St. Mary's, for Young Women; and the Guild of the Holy Angels for Girls. The nature of these Guilds has been already explained in a former sketch—in that of St. Martin's Church; each Guild has its Chaplain, and in those for Women and Girls there is a Guild Mistress as well. In connection with the Guilds there are monthly meetings, at which the "office is said " and addresses are given. There are fortnightly working parties in connection with the Guilds for Women and Young Women. Each Guild has its specific banner, as already noticed, which is carried in processions at festivals—the banners are embroidered with representations of the patron saints. The Confraternity of the Blessed Sacrament has a Ward Meeting on the first Thursday in every month after Evensong. The Foreign Missionary operations at St. Bartholo­mew's are at present upon a limited scale, judging by the number of the monthly paper for January 1882, which says, in speaking of the Bloemfontein Associa­tion for definite Mission Work :—" The members of the Association contributed £10 14s. 0d. to the funds of the Mission during the past year. In addition, 42 garments were made, and I8 miscellaneous articles con­tributed, were sent to Bloemfontein." The congrega­tion at St. Bartholomew's Church evidently realizes that it should let its charity begin at home, as its list of local institutions is much more imposing, and apparently every class is cared for. The parish is mapped out into twenty districts, each under the care of a lady. Married ladies are eligible for the duties, we understand, but it so happens that just now the prefix "Miss " appears to every name in the list. The District Visitors meet once a month. Besides the Schools already spoken of, there are two Bible classes—one for girls, and the other for women—held by ladies, at 45, London-road, the former on Sunday, and the latter on Friday afternoon. There is a District Lending Library open on alternate Sunday afternoons from 5 till 6. One of the Vicar’s favourite institutions is the Choir Club, of which he is the President, and Mr. Brookway is the Secretary. This Club is located at 45, London-road—members of the Choir above 15 years of age are eligible for election. The Club is open every weeknight, from 6 till 10.30, and on Sunday night from 8.45 till 10.30. The Club-room is supplied with newspapers, books, and games; the Vicar often looks in to have a game of chess, and testifies to the friendly and respectful behaviour of the members. Amongst the institutions of an educational or social character, the Amateur Choral Society, the Amateur Dramatic Society, and the Cricket Club may be mentioned; of the first of these the Rev. C. Parnell is President, and the Vicar is President of the two latter. The philanthropic societies in connection with St. Bartholomew's Church are numerous, and are well designed. There are two Mothers' Meetings held every week, at 45, London-road, which, apparently, is a kind of parochial headquarters, and there is a Blanket Loan Society, which, besides other benevolent help, has this winter lent 120 blankets. Two societies seem especially worthy of imitation—one of these is the Ladies' Work Society, of which Mrs. Anders, of 52, Buckingham-road, is secretary, which issues the follow­ing programme:—"The object of the society is to organize definite needlework for the poor. The only rule is, that every lady undertakes to make at least one garment, and send it to the secretary before the first Friday in each month. The society will gladly receive old clothes, which can be repaired before being distri­buted. Donations of money, to enable materials to be bought and made up by poor seamstresses, will be thankfully received. Sales of clothing take place from time to time. District visitors can apply for clothing for any special case of need." It is easy to see that a society such as this, by finding employment for the rich, and supplying clothing for the poor, must, like "mercy," bless those who give, and those who receive. The idea of turning to practical account cast-off clothing is one that the writer has several times ventured to advocate. It is, perhaps, scarcely sus­pected what a large amount of comfort and help could be imparted by the judicious distribution of hoarded-up garments, adapted, by a little care, and in some cases by a small expenditure, to the needs of the poor. This work the society in question aims at, and no doubt succeeds in accomplishing. Last, but not by any means least, is the Invalid Kitchen and Sick Relief. This society is located at 6, Beaconsfield-road, and its institution maybe credited to the Rev. C. Parnell, This gentleman, having been working before he came to Brighton in a parish in Liverpool with an average population of ten thousand poor, had abundant opportunities, especially during an outbreak of cholera, of realizing the importance of supplying the poor with proper diet during illness. He, therefore, soon set on foot a similar society in Brighton, and, since the commencement of the work, 1,800 dinners have been provided. Everything is supplied under doctors' orders only. Wine or other stimulant is only given upon the production of a separate order bearing the signature of a medical man. The following extract from the September number of " St. Bartholomew's Monthly Paper" may furnish a hint for some persons belonging to other congregations. It says: "It often happens that the sick person has no one to send (i.e. to the Invalid Kitchen), and, perhaps, there are some ladies who would be able to spare an hour regularly once or twice a week, who could not undertake a district, and who would kindly be the bearers of a meal to an invalid now and then. And we would also notice that there are many other ways in which the sick require help as well as food, which often might be supplied at a very small expenditure of trouble, but which require a little time and thought. There are also often little delicacies and remains of food, or materials for soup, which could be utilized, and, if brought at the right time, would be sent out at once to those to whom they would be most acceptable." The writer asked the Rev. Mr. Parnell why the "little delicacies, etc.," were not sent for in the manner carried out by the "Little Sisters of the Poor," and found that a modification of their system, namely the collection of food from those establishments in the parish where the proprietors intimate their willingness to be waited upon, is not un­likely to ultimately find a place in the operations of this useful society. The list of services connected with St. Bartholomew's Church is too long for in­sertion here, a summary only can be given, and one or two special features noticed. Holy Communion is celebrated on Sundays at 7, 8, 9, and 11 a.m.; on weekdays at 7.30 a.m., from Advent to Easter, and at 7 a.m. from Easter to Advent. On Holydays at 7.30, 8.30, and at 10a.m., there is a Choral Celebration. There is a second Celebration daily at 8.30 a.m. during Advent and Lent, and the Octaves of Great Festivals. On Christmas Day, Easter Day, Whitsunday, Ascension Day, and on St. Bartholomew's Day, there is a Choral Celebration at 5 a.m. Mattins on Sundays is at 10a.m., and on Weekdays, after the first Celebration of Holy Communion. Litany on Sundays, Wednesdays, and Fridays at 3.30 p.m. Evensong, Sundays at 7; Weekdays at 8, Children's Services, Sundays, at 4 p.m, and on Tuesdays, in Mission Chapel, at 7 p.m. The Children’s Services are very interesting, judging from one the writer attended recently. The afternoon was wet and cheerless, which, of course, adversely affected the attendance, but, on nearing the Church, at a few minutes to 4 o'clock, troops of children were noticed making their way towards the building, and, on entering the Church from the south, streams of little ones were met trooping in from the Sunday Schools by the eastern entrance. Whether the lofty building had the effect of dwarfing the stature of the children or no we cannot say, but it is rarely that a gathering of such mites is seen. There were probably 500 children altogether, and a good sprinkling of adults. The organist was in attendance, and there was a choir of surpliced boys. The service was conducted by the Vicar, the Rev. T. W, S. Collis, who was very plainly attired. The whole service was confined strictly within the stipulated time—thirty-five minutes—and the attention was sustained throughout. The Lord's Prayer and Creed were said, a hymn sung, and a collect repeated. The choir boys then formed in a line before the altar, bowed, and filed off, taking up a position near the pulpit. The Vicar prefaced and concluded his address with the formula usual in High Churches : "In the name of God the Father, &c." The subject selected was the Presentation of Christ in the Temple, and, in a pleasant, homely manner, the rev. gentleman partly told, and partly elicited from his young auditors, the story of the event, and founded some plain and useful lessons upon it. He pointed out that from the nature of the offering presented by the Virgin Mary it was clear that the earthly parents of our Lord were poor, but poverty was no disgrace; that Mary, although poor, offered in the Temple the richest offering ever presented, since she brought Christ, " the Lamb of God who taketh away the sins of the world." After a short description of Simeon and his joy at living to see the fulfilment of all the promises; and the remark that Mary must have been the happiest mother that ever lived because her Son was the best son that a mother ever had the prophecy of the coming sorrow, "the sword that was to pierce" the soul of Mary, the song of Simeon, and the visit of Anna, were all touched upon. The rest of the address was occupied with a description of the uses to which the Temple and its successor, the Church, should be devoted. It was pointed out that it was called God's House, and described by Christ as a "house of prayer," not as a house of preaching. Those who came to it, the rev. gentleman said, should come to pray, and should be reverent and devout; "you should not, "he said, " behave here as at home, or in the streets. It is not wrong to run about; neither does God wish you to go about with sad faces. For my part, I don't like boys who cannot play. But you should leave play, and talk, and laughter, and thought­lessness outside of God's House." After some remarks upon the attitude proper in prayer and the scope of the petitions that should be presented, it was pointed out that God is Our Father. Then came the question, " When were you made His children? " which elicited a series of very prompt answers from the Catechism, showing that the children were well up in the doctrine of Baptismal Regeneration. The address con­cluded with an expression of the preacher's hope that the services in that House of Prayer would be helpful to them, not only whilst they were children, but in after life, until the time came that they should be admitted into the true house of the Father in Heaven. After the address there was singing, and several short prayers were said. During the singing of a concluding hymn, the west doors of the church were opened, and the children were dismissed in perfect order—those nearest the altar leaving first. Just before the dis­missal, the Vicar announced a service for men, to take place at a quarter-past six, to which any boys who had been confirmed were invited. This service for men is attended as a rule by from 70 to over 100. Although professing to act as a bulwark against Rome, it will not have escaped notice that some of the doctrines taught at St. Bartholomew's Church are similar to those which once were considered to belong distinctively to that Communion, such as Baptismal Regeneration, and the Real Presence. Prayers for the dead are also offered and it is evident that Confession is practised; as amongst the general Church notices in the magazine, under the heading of "Confession, Counsel, and Advice," the times are published at which the clergy attend at the Church. Authority for all these doctrines and practices is found in the Prayer Book—that volume susceptible of so many and so various interpretations. The Choir, which consists principally of working-men, all of whom are communicants, numbers between 50 and 60 members, and is most efficient—the loftiness of the church conduces to the fine effect of the musical portion of the services. The income of the church is derived from the endowment already mentioned, the Offertory, and from Donations. The report for January 1882, speaks of the steady increase of the amount of the Offertory since the separation of the Parish. Al­though the building is so large it is found possible to preach in it so that when quite full everyone can hear, but the exertion of course must be consider­able. The clergy do not, we understand, look forward to the proposed extension with pleasurable anticipations, as the erection of the chancel would necessitate the demolition of the Mission Chapel, to which, in spite of its extreme homeliness, they are attached. The clergy at present at St. Bartholomew's are—the Rev. T. W. S. Collis, B.A., Vicar, who was ordained in 1861, by the Bishop of Ely; he began his career in the ministry in England as curate of Luton in Bedfordshire, was afterwards curate at Leighton Buzzard, he was then appointed to the Vicarage of Soulbury, in Bucks, which vicarage he resigned after two years, as he desired a larger sphere of work; coming to St. Paul's Brighton, the rev. gentleman's health, in less than two years, completely broke down. After a twelvemonth's enforced rest, Mr. Collis went to St. Paul's, Knightsbridge, where he remained from 1868 to 1874, when he came to St. Bartholomew's. The Rev. C. Parnell, M.A. : educated at St. John's College, Oxford. He was ordained by the Bishop of Exeter, 1852; and was Incumbent of St. Margaret's, Liverpool, from 1869 to 1876. The Rev. Lionel Bennett Bartleet: educated at the Theological College, Cambridge, and ordained by the Bishop of Chichester. He was formerly Curate of St, John's, Bedminster, and of St. John's, St. Leonard's-on-Sea. The Rev. O. Henning has only been three years in orders, he was a student at Chichester Theological College, and, before coming to Brighton, was curate at Middlesborough, in Yorkshire.